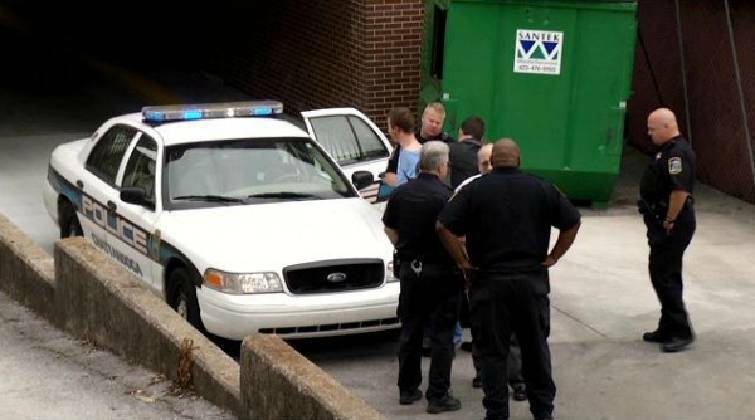 A man has been arrested after stealing an ambulance from Erlanger hospital this afternoon, Hamilton County Sheriff's Office officials say. A call was received by Hamilton County 911 at 2:09 p.m. regarding an ambulance from Memorial Healthcare being stolen from Erlanger Hospital Emergency Room parking lot. The driver of the Memorial Hospital ambulance told deputies he dropped a patient off at Erlanger's emergency room and then pulled the ambulance out of the way due to the amount of ambulance traffic. While he was in the rear of the vehicle cleaning, someone jumped into the driver's seat and pulled out of the lot into traffic. The driver yelled for the party to stop but the suspect just accelerated faster. The driver then reached through the window and pulled on the suspect to the point suspect stopped the ambulance. The suspect then jumped from the ambulance and ran toward the Whitehall Building. A short time later the suspect was located in a red Ford Van parked in the Whitehall garage, sheriff's officials said. The suspect identified as John Edward Shanks, 29, was taken into custody by deputies and charged with auto theft over $100,000, kidnapping, reckless endangerment and burglary of an auto. He was transported to the Hamilton County Jail for booking. Shanks also has outstanding warrants in both in Catoosa County, Ga., and East Ridge.